Description: Fairly open with some elevation and several strategic large trees. Grass well-mowed in season. The #18 hole has unique sand traps surrounding the hole. Tee pads all have benches and trash cans. 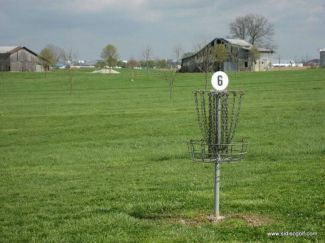 80 acres with walking paths devoted to disc golf. Local Directions: North from BG on Hwy 31W (runs with 68/80) (exit #28 from I-65, then right on 31W north). Left at the Minit Mart on Hwy 526. Park will be on your left, with entrance just after the road forks. Enter and veer right, course is at back of parking area.